(《複数形》 moose) 【動物, 動物学】 アメリカヘラジカ 《北米産; 雄は掌状の大きい角がある》. Earlier mus, moos, from a Northeastern Algonquian language name for the animal, such as Massachusett moos, mws, Narragansett moos or Penobscot mos (cognate to Abenaki moz), from Proto-Algonquian *mo·swa (“it strips”), referring to how a moose strips tree bark when feeding: compare Massachusett moos-u (“he strips, cuts smooth”). (US, Canada) The largest member of the deer family (Alces alces), of which the male has very large, palmate antlers. We saw a moose at the edge of the woods. The usual plural of moose is moose; compare the names of many animals, such as deer and fish, which are also invariant. 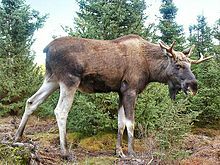 Other plurals are rare and nonstandard: mooses (with the usual English plural-forming suffix -s), meese (jocularly formed by analogy to goose → geese), moosak (presumably derived from the addition of the Abenaki plural-forming suffix -ak). ^ “moose” in Dictionary.com Unabridged, Dictionary.com, LLC, 1995–present. ^ The living Algonquian languages, for their part, pluralize the term with their reflexes of the Algonquian plural sufix -ak, e.g. Abenaki moz, mozak. The moose (North America) or Eurasian elk (Europe) (Alces alces) is the largest extant species in the deer family. Moose are distinguished by the palmate antlers of the males; other members of the family have antlers with a dendritic ("twig-like") configuration. Moose typically inhabit boreal and mixed deciduous forests of the Northern Hemisphere in temperate to subarctic climates.